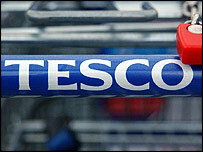 About 50,000 Tesco staff are to share in an £148m payout, after two company share option schemes matured. Under the plan, staff at the supermarket giant save between £5 and £50 from their monthly salary over a three or five-year period. When the scheme matures, they have the option to buy Tesco shares at the price set when they joined the scheme. This year's payout is up on the £111m shared by staff in matured share options last year. Tesco chief executive Sir Terry Leahy said: "Our staff are the main reason so many people choose to shop with Tesco, and through Save As You Earn they can share in the success they achieve through all their hard work."